Please find below a quick and easy guide on checking price and availability of products in the LGC Webshop. Users can use search for products (please see online search below), review the results list, filter the results list on the left hand side, and click into any of the products to view the product detail page and associated price and availability information. 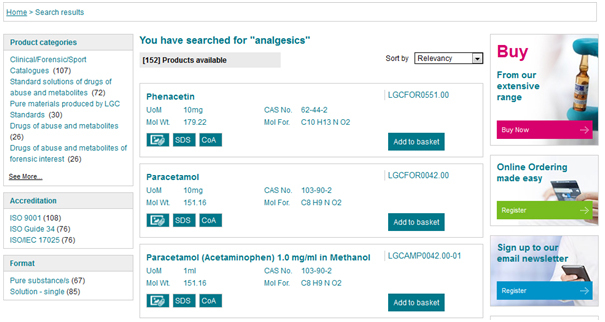 In the Enter search term.. search bar, users can search either by all products, or narrow down search by using the drop down arrow to filter by product name, code, CAS number, analyte or drug group. 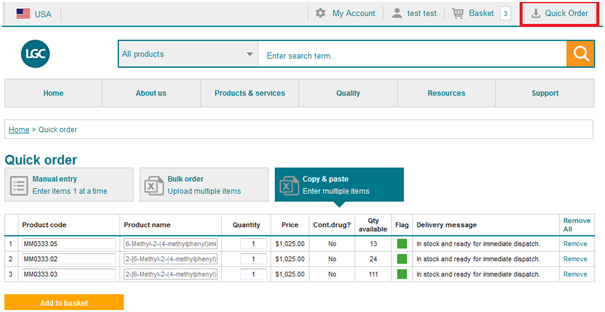 Below is what a user would see when they search for product code “mm0001.00” and click into the product page. The user’s contract specific price is shown plus the stocking information. The LGC Webshop uses a traffic light system to indicate stock availability information to users. Amber - Not in stock but Good availability. Dispatched within 5-10 days of order. Red - Not in stock. Please contact your local sales office for delivery information. If you already know your product codes you can check the price and availability of up to 100 products at a time. Prices are inclusive of contract based discounts. 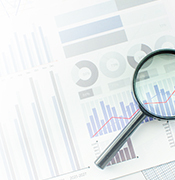 To learn more about our quick order features please visit the quick order user guide section.